We often get asked why resources from the USA HQ seem cheaper than Down Under. There are two main factors that cause the misconception: Shipping & Exchange Rate. Because most of our resources come from the U.S, we have to pay to have the resources shipped over. Shipping by Airmail is very expensive, even shipping by sea can still incur Duty and GST costs. Our Down Under shop prices already have the International Shipping amount included, which means it’s not really an even comparison. 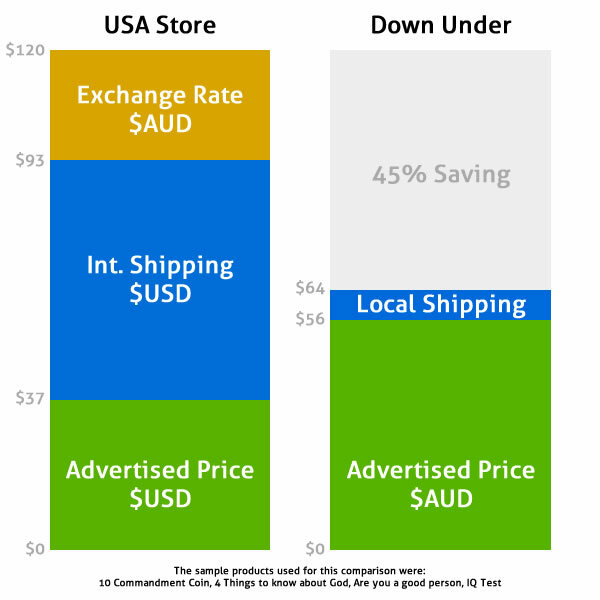 Once you factor in the Shipping costs, our Down Under prices are almost always much cheaper. The last thing most people forget about is the Exchange Rate. When purchasing items online from the USA, you will pay in US dollars. This means the price you see, is about 30% less than what you will actually pay. The exchange rate difference will be added to your Credit Card without you even noticing. This graph shows a sample purchase from both the USA & Australia.